This film is on the Worst of 2004 list. If you've had a lousy Christmas, why not top it off by watching one of the worst Christmas movies ever made? Christina Applegate has an amazing gift for being neck deep in cinematic manure ("Anchorman," "A View from the Top," "Just Visiting") without actually getting any of it on her. A much better actress than she's given credit for, and a nuanced comedienne, in "Surviving Christmas" she's trapped in a grossly underwritten role as the sensible daughter of a suburban family paid $250,000 to take in a screwed-up millionaire for the holidays in his vain (in both senses) attempt to relive his childhood. Without upstaging anyone, she creates brief, bright moments with her rib-tickling timing and her sincerity, despite being saddled with the movie's most insulting task -- falling in love with this shallow, selfish jerk who remains a shallow, selfish jerk right up to the closing credits. Her ability to infuse this pathetically one-dimensional role of generic romantic interest with more authentic personality than anyone else on screen is the only reason this movie -- very possibly the worst Christmas movie ever made -- earns a rating of 1/2 a star. The jerk -- whom we're supposed to grow to understand because of some cheap-cliché sob story about his lower-class upbringing in this same house -- is played by Ben Affleck, who has an equally amazing gift for picking the worst scripts ("Gigli," "Jersey Girl," "Daredevil," "Pearl Harbor," "Armageddon") and often giving the worst performances in the resulting movies, which is certainly the case here. Bursting with ridiculous, high-pitched, arm-flappingly fake yuletide glee that he demands his family-for-hire emulate for his pleasure (per contractual obligation), Affleck's character is an insufferable egoist who learns nothing in 92 minutes but is still handed an off-the-shelf happy ending, complete with a girl he doesn't deserve. 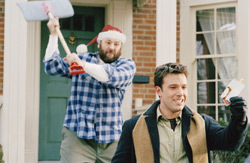 Affleck is a large part of the reason "Surviving Christmas" gets no more than 1/2 star. Lifelessly directed by Mike Mitchell ("Deuce Bigalow: Male Gigolo") from a slapped-together script by a foursome of career Hollywood hacks (who can't even keep track of the film's timeline, which seems to take place over several work-free weeks instead of a few days off), this movie's idea of a punchline is Affleck bouncing enthusiastically on a step to the second floor squealing, "You know what we used to call that squeaky stair? The squeaky stair!" Its shorthand, everything-on-cue idea of story development is that intelligently dubious Applegate suddenly finds herself attracted to self-absorbed schmuck Affleck just because they both catch a cold while sledding together for no adequately explored reason. The ad campaign for "Surviving Christmas" has been making hay about the film's incongruous October opening date as a counter-programming marketing strategy, but I have another theory about that curious choice: Could it be that, in an uncommon fit of conscience and good taste, some studio executive decided to release it early so as not to ruin anyone's actual holidays?